A Memorial Service will be held at 10am, Saturday, June 21, 2014 at Westminster Presbyterian Church, 3900 West End Avenue, Nashville, TN with a reception at the church following the service. 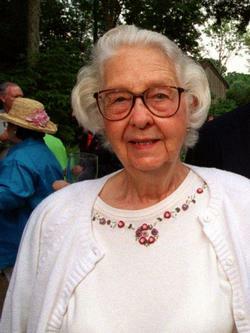 Elsie said many times that she greatly appreciated the way many different groups mingled to work to preserve, protect, and enjoy plants and the environment they are part of. The family hopes that the service and reception will continue that mingling which she so enjoyed. or any other group dedicated to enjoying and preserving plants and their environment. Dr. Quarterman was born in Valdosta, Ga, to David Sinclair Quarterman and Alla Irene Peek. She was predeceased by her parents and her elder sister Jane Quarterman Comer (Walter) of Moultrie, GA, and her brother David Sinclair Quarterman Jr. (Laura) of Hahira, Ga. She is survived by her nephews Stephen Patrick Quarterman (Ann) of Nashville, TN, David Leon Quarterman (Cathy) of Hahira, GA, and John Sinclair Quarterman (Gretchen) of Hahira, GA; grand nephew David Nicholas Quarterman of Nashville, TN; grand niece Margaret Campbell Quarterman Stewart (Garner) of Richmond, VA; great grand niece Margaret Sinclair Hamilton Stewart of Richmond, VA; first cousin Peter Clark Quarterman Jr (Muriel) of Quitman, GA; step grand nephews Wesley James Linton Jr of Nashville, TN, John Alexander Linton (Misty), of Hermitage, TN, and Adam Lawrence Linton (Latoya) of Nashville, TN; and step grand nieces Lindsey Jane Phillips Williams (Roy) of Partlow, VA, and Mallory Kaye Phillips Breingan (Gil) of Media, PA; step great grand niece Channing Nicole Linton of Hermitage, TN, and cousins. See the Elsie blog page for many more stories and pictures of Aunt Elsie.